Big Lottery funded 21 Talent Match programmes across the country including Leicestershire between 2013-2018. The aim of the project was to help 18-24 year-olds who had been unemployed for more than 12 months get back into work. 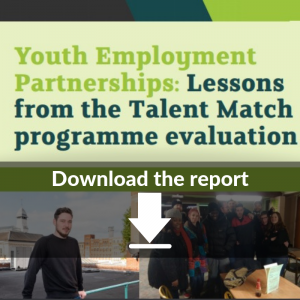 Young people were at the forefront of the project and were encouraged to take an active role in shaping what was required to help them achieve sustainable work. This was a “test and learn” project and some of the key successes included the creation of video CVs; the set-up of micro-businesses run by young people; youth employment accessibility research designed and delivered by young people and an award-winning supported work model with mentors (winning the Business and Education Partnership category in the 2017 East Midlands Chamber of Commerce Awards). Key to these successes was to work with expert delivery partners who helped and guided the young people on their journey into the workplace. Delivery partners for the project included; Access All Areas, Access Generation CIC, B-inspired, Confident Communities, Highfields Community Centre (HCA), HQ Recording Studio, Leicester City Council and Seed Creativity. Through the project, it was realised that many people in this age group who were long term unemployed also had a hidden condition. This included anxiety, depression, mental health issues, autism and dyspraxia. “Hidden Talent” became an important campaign within the project to highlight the support an employer might need. Find out more about “Hidden Talent” in the reports below or see the blogs published by Peter Colley, the young person who created the campaign. Sheffield Hallam University undertook the social impact reporting for the project. See the evaluation report and infographics below or visit the Sheffield Hallam University website for all reports from the five-year project.